Karlos Miller is the only comedian in the world from the back roads of Oxford, Mississippi! He moved to Atlanta in 2005 to pursue a career as a stand-up comedian. He landed a slot cracking snaps on MTV's "Yo Momma" and was also featured on season two of Bill Bellamy's "Who's Got Jokes?" In 2008, Karlous was selected to play various roles as a cast member on season two of BET's prank dating show "Hell Date." He has been featured on V-103's Frank and Wanda morning television/radio show, Atlanta's HOT 107.9 as well as a guest on The Mo'nique Show. 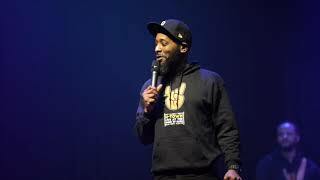 Karlous has worked with various headlining comedians and artists like Katt Williams, Daniel Tosh, Doug Benson, Case, Gucci Mane, Dem Franchise Boyz, Grandaddy Souf, Big Oomp, Jermaine Dupri, and T.I's Grand Hustle Comedy.